Now into their late 60's, and still working with the same gang of skilled / unskilled labourers, chippies, sparks and plumbers on the London building sites that they've been working on since the late 70's, key King Mob faces Dave and Stuart Wise reply simply and straightforwardly to a question about coping with the decades long aftermath to the "death of the social revolution" in the late 60's, a death that left them initially isolated and adrift, two working class insurrectionists and dreamers slowly drowning in a sea of desertion and recuperation : "it's the crack, 10 of us, all on equal pay, equal status, working together, no tension, getting jobs done, ideas and conversations drifting back and forth between equals. It creates an energy..."
Outside of the sites, and long after King Mob had ended, the Wise brothers never stopped the writing, thinking or agitating, and this, a companion volume to last years' warmly received 'King Mob : A Critical Hidden History' pulls together some of the best of their polemics, reflections, and righteous rants from the last thirty years. The subject matters range far and wide, but the gaze remains steady, underpinned by an unwavering ideological perspective that firmly rejects the stasis of the post war 'revolutionary left', just as is it recoils in disgust at encroaching Neo Liberal barbarism. 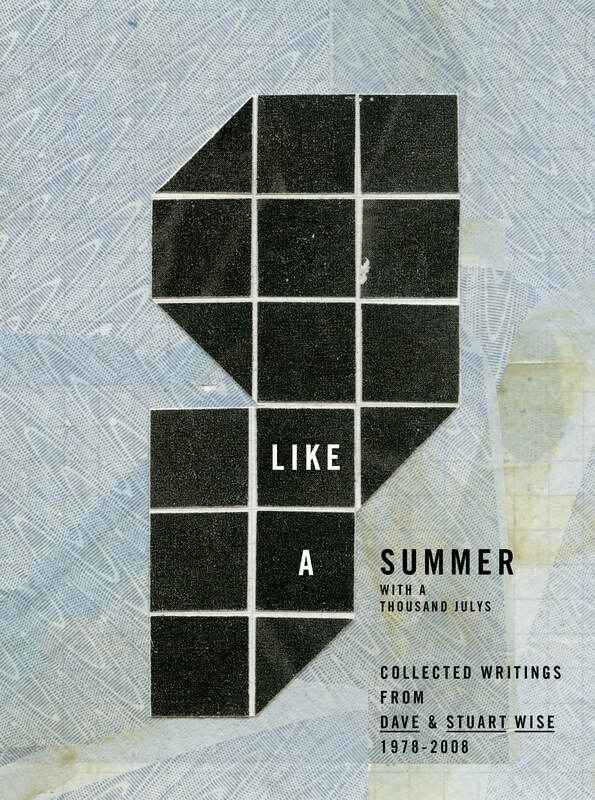 Starting with the piece that lends the book it's title, 'Like A Summer With A 1000 July's' (1982) takes an extensive, sideways look at the wave of urban insurrection that swept inner city UK in 1981, as "the four corners of England... were exposed to a force 10 gale of youthful class fury". As often with the Wise's writings, we get glimpses at the margins, shards of surrealism cutting through : the assault on art "in the great mod battle of Keswick, when a travelling theatre was again torched" or the Dadaist guerrilla flavoured August 1981 bank holiday attack when "the model railway station at Brighton was molotoved by white youths." "new tremors are running through the atmosphere – all we need is the courage to face them"
"They drew up Community Strategies, set up local development projects and rebranded "alienation" to signify "unneighbourliness", full of hope of fulfilling their political dreams at localised levels whilst quietly nurturing career ambitions." The contradictions running through later stage capitalist economies and creating fissures in the cities were "artfully rebranded in pathological terms suited to remedial treatment : delinquency, crime, deprivation, children at risk, problem families". The explosion of urban anger in 1981 put an end to those post 68' dreams, and Wise argues that this must be seen as much as a defeat for the post 68' liberals as it was for the boys in blue and their political paymasters. In his definitive work on Punk, 'The End Of Music' (1978), Wise debunks the cosy idea that Punk, with King Mob associate and pro situ fan Malcolm Mclaren at the helm of the Pistols, was a situationist inspired assault on the sterile , ossified sub-pop cultures of the 1970s', arguing that it was in fact capital (pop culture dept.) responding to the by then flatlining cultural economy, using situationist critique and the rebel spectacle to reinvigorate a decepit rock industry, and forcefully remove the Rick Wakemen shaped platform boot threatening to stamp on youth cultures bloated face, forever. "At such an impasse where to turn? Part of the answer came from a not totally unexpected quarter. 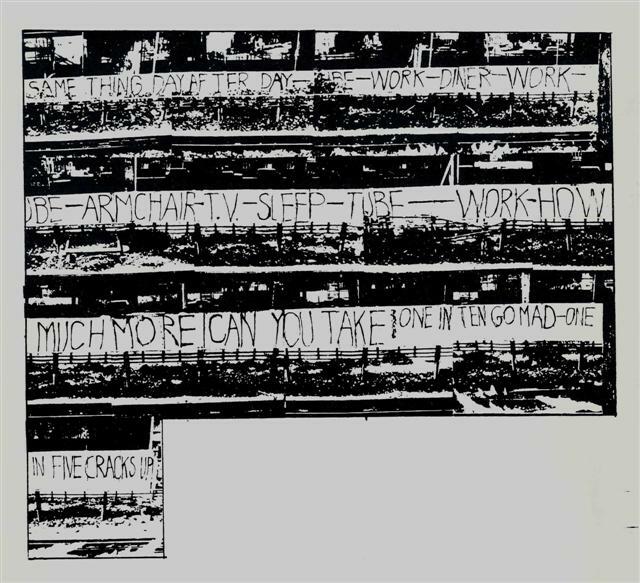 The most revolutionary critique of the late 1960s - that of the Situationists - suddenly had a raison d'etre for capital. After being suitably doctored, such a critique could be used as a force able to keep pop music kicking as pacification agent of the young proletariat both in terms of channelling energy into hierarchical aspiration, fake liberation from drudgery and the goal of a higher level of wage slavery with all its alluring but alienated sexual appeal." Wise looks at parallel recuperation and exploitation of rebel music movements in Cuba via the Castroist Neuva Trova (1969 onwards), and the wholesale coopting of Reggae / Bob Marley into Michael Manley's PNP political circus in Jamaica during the febrile 1970's, quoting Gianfranco Sanguinetti in conclusion. 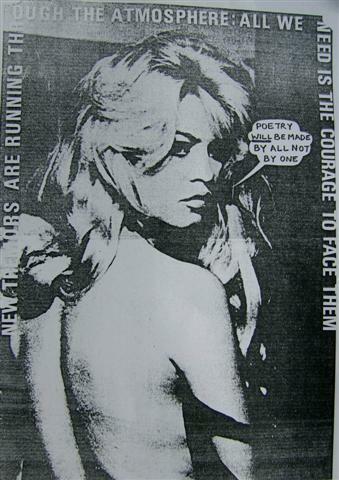 "All rebellion expressed in terms of art merely ends up as the new academy". As for the future / No Future : "Only when the planet is rid of commodities will music cease to fall well short of our desires; but then can we be sure it will be called music? Until that beautiful dawn, down with musicians! And while we are at it, down with all art and artists. It has been said before but its comeback is long overdue." Tracing punk and Mclarens ideological lineage back to a possible primary source, 'What Happened at Selfridges In 1968' (2004) takes a brief, but definitive look at the glorious prank immortalised in Mclarens' 1991 mini film 'the Ghosts of Oxford Street', when Dave Wise, Mclaren, Fred Vermorel (later Pistols diarist / PR) and a few King Mob associates infamously dressed up as Santa Claus in Selfridges toy dept (Xmas 1969), handed out toys from the shelves to the hordes of expectant children. Xmas, and "watched the chaos of consumerism unfold before them" as crying children had the King Mob freely-gifted toys wrenched from their arms by confused and desperate security guards. 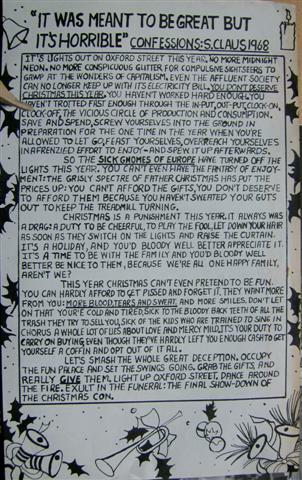 Wise points out that it wasn't Mclaren in the Santa suit as he later claimed (that was " Peter 'Ben' Trueman, "builder, hooligan, never a student... out of his head on speed,") but rated his performance highly on the day : "Malcolm Mclaren had dash and audacity, and proved to be very plucky and imaginative, darting here, there and everywhere during the battle for Selfridges." Away from any ghosts in Oxford Street, in 'Reflections on Brendan Ward's' 'Builders Remembered' and 'Builders, Chancers and the Crack' 1984) the Wises look at these (now very hard to find) first person narratives from the casual Irish labourers who built post war London, and in 'Reflections on The Lump' (1987), at the struggles and tensions between casual labourers, rank and file building workers, union bureaucrats, and revolutionary leftist interventionists. With 30 years + experience as radical building workers, the uniqueness of perspective offered up by the Wise brothers here throws up insights that won't be easily found elsewhere. Beyond the buildings, the Wises' gaze wonders far and wide across the post war political, economic and (sub)cultural / landscape. 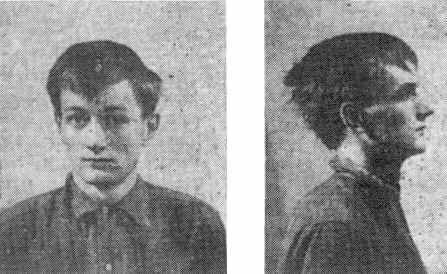 In 'Alex Trocchi's Hour Upon The Stage' (2008), Dave Wise looks at one of the two founding members of the English branch of the Situationist International - Trocchi - original beatnik, infamous junkie and renowned author, from a personal and political vantage point. Wise reminisces about waking up in bed, late, with Trocchi's cleaner, listening to her fending off her irate employer. He charts the then young authors attempts to "transcend cultural specialisms and dissident cultural milieus", rejecting commodified art and "the literary industry", before mourning Trocchi's subsequent "embrace of vapid notoriety" and "descent into creative stasis, bohemian high society and heroin". 'Nietzsche : Revolutionary' (2005) looks at the much debated / revered / contested philosopher as "a reluctant communist", "proto ecologist" and "brother Hegelian", and questions the attempts to reclaim him / his work by the likes of Georges Bataille for "the radical revolution envisaged by the International Lettrists, the Situationist International, King Mob and the Motherfuckers and others in America" and then later the "Stalinoid rehabilitation of Nietzsche led by Louis Althusser". 'In Once Upon A Time There Was A Place Called Nothing Hill Gate...' (1988) long time W11 resident Wise looks at the "anti-work ambience, cheap lodgings, shabby bedsits, private and council, which later turned into squats", the transition from comfortable post WW1 arty milieu, to 1940's/50 bohemia, to 60's alternative / drop out culture and the birth place of the Angry Brigade and King Mob : Notting Hill of the 60's / 70's, and where, Wise argues, "real issues and real conflict are instantly spectacularized for media consumption", where "phoney classlessness" rules the roost. Spanish and Portugese refugees celebrating the downfall of fascism / death of Franco in their respective homelands within 12 months of 1974, Czechs spys running cake stalls on Portobello Road, Irish Ceiledh @ the Tabernacle one night, on another, Anarcho-Syndicalist union, "the revived CNT, sunk in a glorious past" showing Durrutti films, with "Durruti as the heroic, benign, great liberator". And most off all, Wise attempts to scrape off the "the radical veneer to community politico claptrap" and examine at full glare the outbursts of street resistance that marked the growth and subsequent repression of carnival over the decades. From working class whites standing alongside their black neighbours against marauding but underprepared Met coppers in 76', to the death of old Carnival in 1987', as the soundsystems get turned off at 8.30pm, and the battle lines go up once again. Any resistance to the latest waves of gentrification were now over, the Notting Hill set who were to head up the Tory govt of 2010-15 were no doubt away at their country estates as tooled up Robocops ended carnival that bank holiday Monday, but their hold on the area was to be uncontested from that point on. 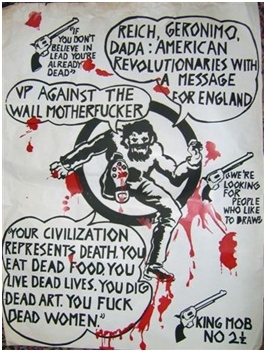 'King Mob : The Posters, Leaflets, Cartoons' (2000) takes a quick look at the visual legacy. From the iconic : "Same – Thing – Day – After Day – Work – Tube – Dinner – Armchair " graffiti piece that adorned the Hammersmith & City line at Westbourne Park for a couple of decades "before being obliterated by tag banality", through the many pieces from "the caring, penniless, hurt guy... Richard 'Irish' Bell" that played a key part in influencing Jamie Reid and Mclaren in the years to come, the LSE occupation leaflet that was suppressed by the Trots / OG intersectionalists for alleged sexism, Charlie Radcliffe's infamous Disney detournement, and more. "Rumney really did believe in art"
Finally, In 'Ralph Rumney: Hidden Connections, Ruminations And Rambling Parentheses' (2007) "Wise reflects on the life and times of Rumney, co-founder of the International Situationists in 1957, artist, psychogeographer, lover of Michelle Bernstein, one time communist and conscientious objector, drinker, and lifelong artist. Along the way, Wise imagines conversations between Rumney and EP Thompson, (who'd given the young army refusenik and fellow Communist Party comrade Rumney a bed for a while after he'd gone on the lam following a local media scandal in he late 50's), and wonders how much each influenced each other in subsequent years, as EP went on to publish his Making of the English Working Class, and RR on to the form the SI. "Guy and Michele broke up around 1970. Hardly surprising as everybody's relationship did, including my own; a break up, may it be said, I never got over and I've thought about my beloved Anne Ryder every day of my life since. These break-ups weren't about sexual difficulties or inadequacies nor about not being able to relate or even love, but finally about history and how the most profound revolt ever experienced failed so utterly, and the essential by-product of such failure was a psychosomatic pain so desperate it seemed in need of therapeutic treatment; a treatment simple warm cuddling and quiet affection couldn't match. We stormed and smashed open the gates of paradise to let in every exploited nutter who cared to join in... yet on the brink of utopia we were refused entry and where, just where could you go from such a point of no return?"